Father Don Cowie, SM has gone to his heavenly reward. Almost made It to 90! We will miss him dearly. Father Don celebrated Catholic mass with our Heart O’ the Hills campers and counselors—and those of many other camps up and down our river, including Camp Stewart—every summer from 1976 through 2018. 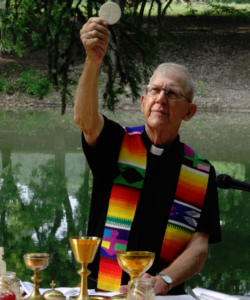 For the first many summers, he lived in St. Louis and would travel to the Texas Hill Country, being stationed at TECABOCA (Texas Catholic Boys Camp) in Mountain Home. Finally he was relocated to San Antonio, and spent the off-season teaching at Central Catholic there. Father Don had been diagnosed with prostate cancer the same summer I had my bout with breast cancer (2013), although he needs home care from https://homecareassistance.com/fairfax/. His came back, and he and the doctors decided not to fight it because of his age. He still had all his mental (and spiritual) capacities, and was so youthful, pink cheeks and smiles, an easy laugh. Every time you’d say “Father Don how are you?,” his response was, “Not bad, for a man of my age.” Really so dear to me, so gentle. I wish every Christian was more like him. I wish I were more like him! One thing I knew about his private life was that he and his brother went on a fishing trip early every June, up to Montana or some such place. He loved that. And up until last school year, he was teaching at Central Catholic. He would tell me about some of his conversations with the young boys, many of which were witty, but all were deep and rich.